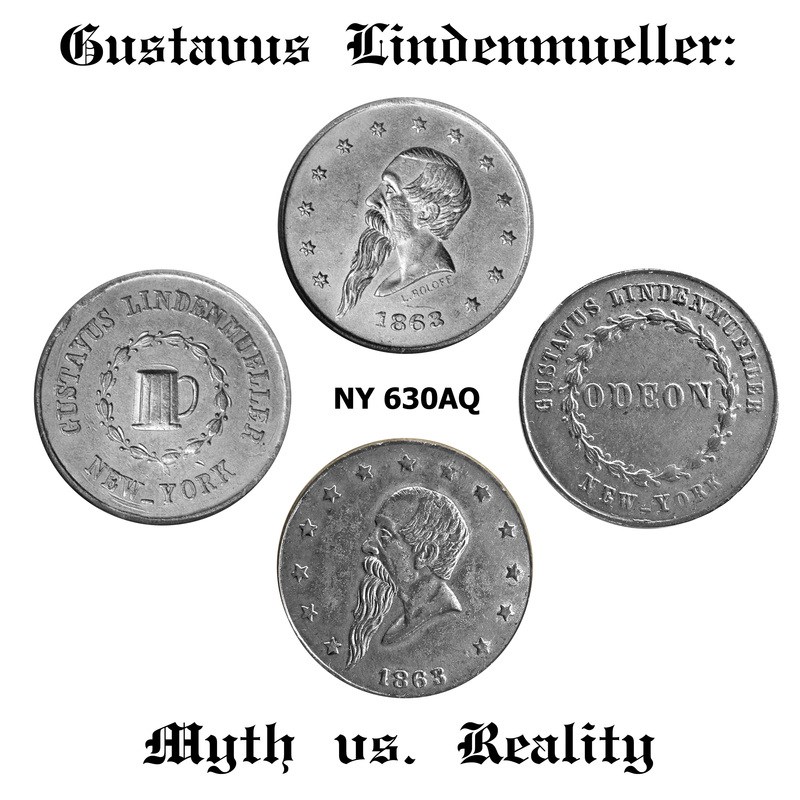 "Gustavus Lindenmueller: The Myth, The Man, The Mystery"
(1) Lindenmueller was the first in New York City to issue Civil War tokens, the NY 630AQ varieties, in early 1863. (2) Lindenmueller issued (at least) one million tokens. (3) Lindenmueller’s refusal to redeem his tokens played a major role in the government's decision to ban such tokens. • It is widely known. • There may be variants to the story. • No one seems to know how, or where, the story originated. All of these apply to Lindenmueller’s story. In an attempt to track down the Lindenmueller story, we have drawn together available information about his life. Although this information is fragmentary, there is enough to document his activities extensively over the fifteen year period from 1851 to 1865. The story turns out to be quite interesting. Gustave Müller, or Lindenmüller, may have been involved in the revolutionary movements in Germany in the late 1840s, as one Lindenmueller of New York City was granted an amnesty by the King of Prussia in 1861.6He was established as a seller of lager beer in New York City by early 1851. In that year he was sued for nonpayment by his beer supplier, Adolph Schalk, who had supplied Lindenmüller with beer from 23 March 1851 on.7 In February 1852 Mr. Lindenmuller was a member of a committee that went to Albany regarding the murder conviction of one Otto Grunzig.8 Then, in 1854, Lindenmueller was the subject of several letters to the editor in the New York Daily Times.9 He had a saloon at 118 Chatham Street in New York City, said to have been converted from a bowling alley, and was providing free dinners to hundreds of the poor on a daily basis. The letters, from anonymous sources, were soliciting donations to supplement the support being given for the program by the city’s German population. Evidently he moved later in the year to 49 Bowery, where he was the proprietor of the Odeon Theater, a lager-bier, concert, and theatrical saloon. On 18 December 1858 his theater building was destroyed by a fire that also consumed two neighboring buildings.15 The cause of the fire was an illuminated artificial Christmas tree in the main theatrical room. Fortunately, no one was seriously injured. In the following year Lindenmueller opened another saloon at 175 Bowery. The struggle against the Sunday laws was then being framed as one against the establishment of particular religions, which violated the U. S. Constitution.16 In early 1860 the New York State Legislature passed a new law that banned all public theatrical performances on Sundays in the City and County of New York.17 Lindenmueller had now moved his saloon and theatrical establishment, the Odeon, to 199-201 Bowery. It was to remain at this location for the next four years, with an expansion by 1862 to 199-205 Bowery. Nearly a thousand half-drunk Germans listened to and applauded these Atheistic ravings in a Sunday Theatre, in the interval of comedies performed in open, avowed defiance of a law of the State, passed within a fortnight! Until the recent conviction of Lindenmuller for violation of the Sunday laws shall be confirmed, no German will probably ever yield to the law without resisting to the last. Lindenmueller then appealed to the New York Supreme Court in the case Gustav Lindenmüller vs. The People. In May 1861 he lost his appeal, and this case became a landmark in establishing the legality of legislation that restricted Sunday activities.25 Subsequently, in a surprising reversal in 1866, the New York Times came out for a relaxation of the Sunday laws which would permit operation of German beer gardens. The motivation for this was to attract a voting block to the support of the Republican Party in New York City.26 But Sunday liquor sales restrictions remained the law in the State of New York until 2003, when the prohibition was relaxed to permit establishments to choose one day per week when liquor would not be sold. This partial restriction was universally unpopular, and in August 2004 every-day liquor sales were legalized. In the Atlantic States a large amount of cent tokens have been issued by private parties and are now in circulation. This issue by private parties of coins bearing a close resemblance to the coins of the United States is a reprehensible practice, and is injurious to the public interests. It therefore seems proper that some provision should be made by law to prohibit it. It is difficult to see how either law would have made the Lindenmueller tokens illegal. Both by design and physical appearance, these tokens could not have been confused with either one cent or the new two cent coins, and they made no claim to monetary value. Surely the litigious Lt. Lindenmueller would have vigorously challenged any attempt at prosecution over his tokens! I would like to thank Joan Koster-Morales and Prof. Hans Schollhammer for their assistance, and Q. David Bowers and Jeff Shelton for their helpful comments. 1. George Hetrich and Julius Guttag, Civil War Tokens and Tradesmen's Store Cards, New York City, 1924, p. 5. 2. George and Melvin Fuld, U.S. Civil War Store Cards, Second Edition, Quarterman Publications, Inc., Lawrence, MA, 1975, p. I; George and Melvin Fuld, Patriotic Civil War Tokens, Fifth Revised Edition, Krause Publications, Iola, WI, 2005, p. 6. 3. Roland P. Falkner, "The Private Issue of Token Coins," Political Science Quarterly, Vol. 16, No. 2 (June 1901), p. 326. 4. "Every Man His Own Mint: War Days When Coin Bore A Business Stamp," New York Times, 2 November 1896, p. 16, reprinted in the Civil War Token Journal, Vol. 38, No. 1 (Spring 2004), p. 19. If so many of Lindenmueller’s tokens had been acquired by the Third Avenue Railroad, it is surprising that there seems to be no contemporary report of this. 5. The American Numismatist, Vol. 1, No. 1 (September 1886). 6. Milwaukee Daily Sentinel, Milwaukee, WI, 21 February 1861. 7. Adolph Schalk vs. Gustave Müller, sued as Gustave Lindenmüller, Superior Court of the City of New York, Case No. 2145, 1852. Perhaps Lindenmueller is the "Gustans Muller," laborer, age 26, born in Germany, listed in the 1850 census in Ward 8, New York City [p. 314, family #2605]. 8. New York Daily Times, 27 January 1852, p. 2; 24 February 1852, p. 1. 9. New York Daily Times, 20 January 1854, p. 3; 23 January 1854, p. 1; 24 January 1854, p. 3. 10. New York City directories for this period provide information for the directory year ending on May 1, incorporating information gathered as of May 1 in the previous year. 11. Brooklyn Eagle, 15 October 1860, p. 2. 12. New York Times, 30 January 1858, p. 2; 3 June 1859, p. 4. 13. New York Daily Times, 27 July 1857, p. 4. 14. New York Times, 9 August 1858, p. 8. 15. New York Times, 20 December 1858, p. 8. 16. New York Times, 2 July 1859, p. 1; 9 July 1859, p. 5; 11 July 1859, p. 8. 17. New York Times, 20 January 1860, p. 6; 17 March 1860, p. 4; 21 April 1860, p. 8. 18. New York Times, 23 April 1860, p. 5. 19. New York Times, 26 April 1860, p. 8; 30 April 1860, p. 5. 20. New York Times, 2 May 1860, p. 8. 21. New York Times, 28 May 1860, p. 4; 4 June 1860, p. 4; 13 June 1860, p. 4. 22. New York Times, 31 July 1860, p. 4. 23. New York Times, 20 October 1860, p. 2; 15 November 1860, p. 3. 24. New York Times, 19 November 1860, pp. 2, 4; 20 November 1860, p. 3; 21 November 1860, p. 2; 24 November 1860, p. 4. 25. New York Times, 21 February 1861, p. 2; 30 May 1861, p. 5; 4 June 1861, p. 2. 26. New York Times, 14 November 1866, p. 4. 27. Augustave Lindenmuller appears in the 1860 census in the 14th Ward of New York City, p. 621, family #1493. 28. New-Yorker Staats-Zeitung, 25 September 1858, p. 4. 29. New York Times, 20 December 1858, p. 8. 30. Military service file for Gustav Lindenmuller, National Archives, Washington, DC. 32. New York Times, 15 August 1863, p. 2. 33. New-Yorker Staats-Zeitung, 9 April 1864, p. 6. 34. Register of Deaths, Department of Health, Borough of Manhattan, City of New York, Liber No. 43, 1865, Death record for Gustav Lindemiler [sic]. 35. New-Yorker Staats-Zeitung, 14 May 1865, p. 8; 15 May 1865, p. 5; Surrogate’s Court, New York County, NY, Liber No. 81, p. 21, Bond Book 110. 36. Rachootin, Sterling A., Tokens of the Civil War Era, Collector Lecture Series Videotape, Media Resource Corporation, Long Beach, CA, 1992. 37. Although the J. H. Warner tokens of New York City (NY 630CA) are dated 1862, these are rare and most likely were not widely circulated. 38. Proceedings of the American Philosophical Society, Vol. IX, 1865, pp. 249 250. 39. Benj Fauver, "Why Lindenmueller Laughed," The Copperhead Courier, Vol. 13, No. 1 (Spring 1979), pp. 14-15. 40. This distinction is reinforced by the designs of the reverse dies for the tokens, which have Lindenmueller’s head in profile surrounded by thirteen stars. The two types of tokens are readily distinguished by their reverses since those for the ODEON tokens have stars with five points, while those for the beer mug tokens have stars with six points. Evidently all the Lindenmueller tokens were struck by Louis Roloff, who signed the later reverse dies. See George and Melvin Fuld, U.S. Civil War Store Cards, Second Edition, Quarterman Publications, Inc., Lawrence, MA, 1975, pp. 259-260. 41. According to Brother Basil Leo Lee, Discontent in New York City, 1861-1865, The Catholic University of America Press, Washington, DC, 1943, pp. 172, 180, the price of malt liquors in Brooklyn was raised from three to five cents a glass in November 1863. All the leading saloons in New York and Brooklyn raised beer and ale prices to ten cents a glass in July 1864. The fare on the Third Avenue line was five cents in October 1864. Lindenmueller’s advertisement in the New-Yorker Staats-Zeitung for 25 September 1858, p. 5, sets the entry fee for the Odeon at six cents, including a glass of beer; the advertisement for 18 March 1864, p. 6, gives the admission fee as ten cents, with children over six years old admitted for half price and younger children free. 42. As noted above, Lindenmueller did give three weeks notice of the closing of the Odeon in his newspaper advertisements, so his clients could have redeemed their tokens during this period. 43. One such note sold for $5,000 plus a 15% buyer’s premium at Stack’s auction of the John J. Ford, Jr., collection in Atlanta on 26 May 2005, lot 4136. Its image is reproduced here by permission of Stack’s. 44. The Congressional Globe: Containing The Debates and Proceedings of The First Session of The Thirty-Eighth Congress, Vol. 2, 1864, pp. 1207, 1227 1228, 1772, 1802, 1842; Vol. 4, 1864, Appendix, pp. 155-156. 11. The Congressional Globe: Containing The Debates and Proceedings of The First Session of The Thirty-Eighth Congress, Vol. 3, 1864, pp. 2265, 2741, 2750, 2856, 2879; Vol. 4, 1864, Appendix, p. 176.